This post is all about nutcrackers. I have collected some over the years. 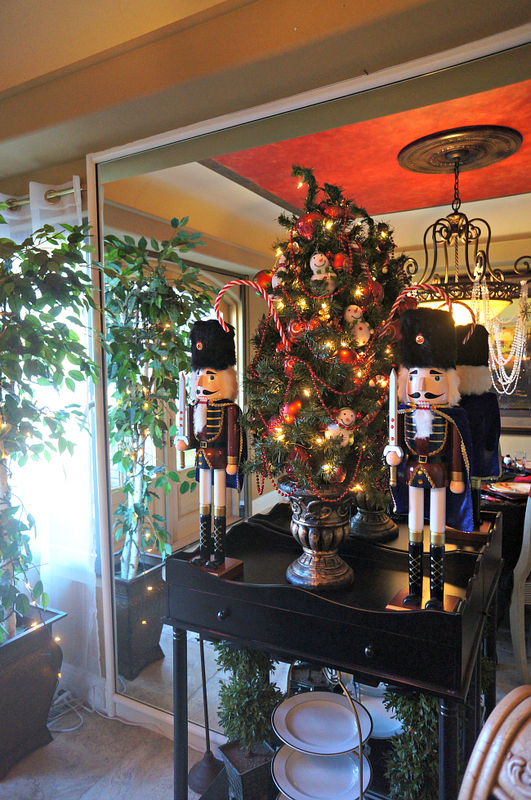 The newest one is the Mackenzie Childs nutcracker that is sitting on a lampshade. I added a red charger on top, so the nutcracker can sit nicely. You can see up close how this sweet nutcracker looks. Two tall nutcrackers flank the small Christmas tree. 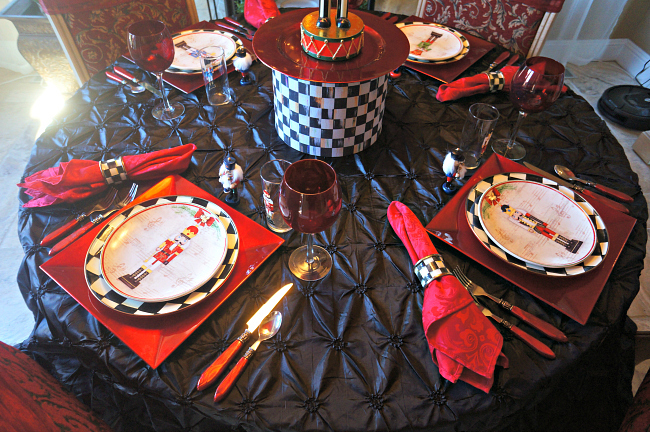 Red dinner napkins tie in with the black and red theme. The flatware is from horchow on sale. I always dress our chandeliers. The white beads show up nicely with snowflakes hanging. I have been sick, so I am behind on my visiting and commenting. I have no energy. Luckily, my two brothers drove up to help my parents. My youngest brother drove home Sunday night, while my other brother is staying thru Thursday. I am hoping by then, I will feel better. Stay healthy my friends. Beautiful! My Rare One and I have a thing for Nutcrackers too. We collected them for awhile -- have about 15 now. They are all "traditionally" dressed except for the one whose uniform is green sequins and one whose uniform is red sequins. We call those two our Gay Nutcrackers. They are my fave, of course. Debra, by all means, collecting nutcrackers is a lot of fun. Linda, what a great collection, I so love Nut Crackers. I specially adore those plates. I think everyone loves nutcrackers. Those plates I bought at World market years ago. Enjoy your week as well. 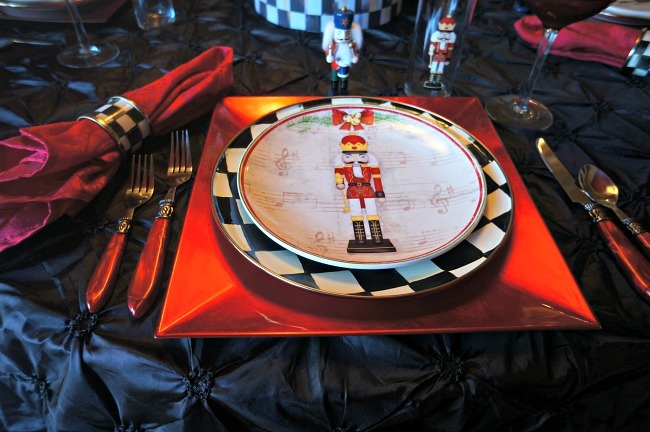 Your nutcracker tablescape is gorgeous...what a sight! Love the newest addition to your collection. Thank you Gina. I hope to be on the mend soon. I have things to do. 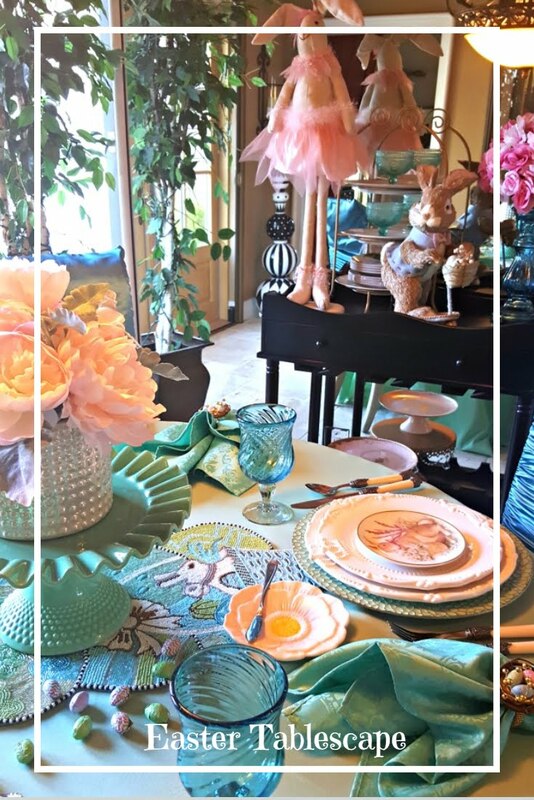 I love nutcrackers, and your plates and nutcracker collection are stunning! Your centerpiece is so much fun! Thanks so much Ricki Jill. Loving my new MKC nutcracker. First of all I hope you are better SOON! I love this table. I have some nutcrackers too and haven't done a table with them yet. Love the centerpiece! All is beautiful, as always! What a beautiful collection of nutcrackers. I have never been a fan of them, but I decorate with snowmen each year. 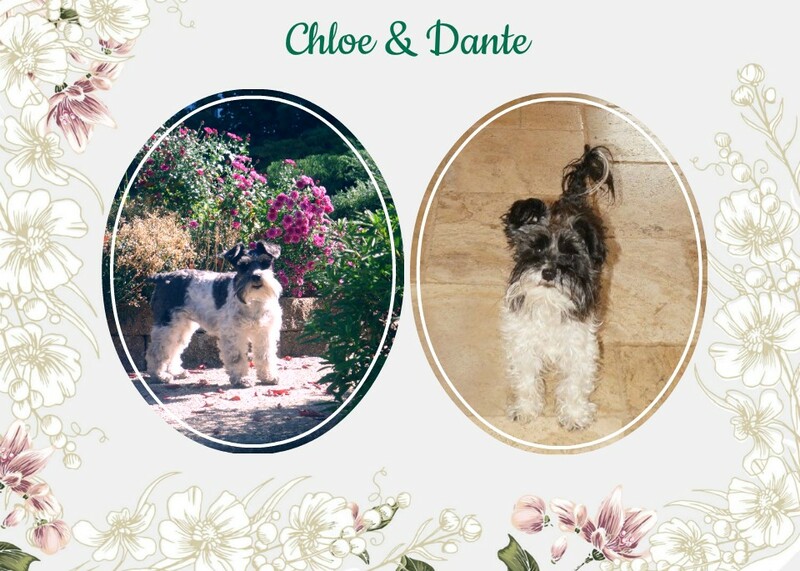 They melt my heart! 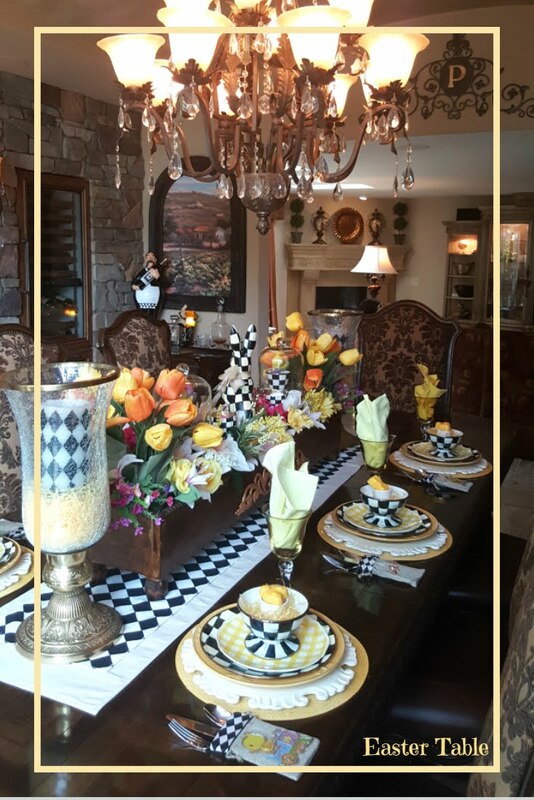 Another WOW tablescape! Best use of nutcrackers I've seen yet. Nicely done Linda! I love nutcrackers! 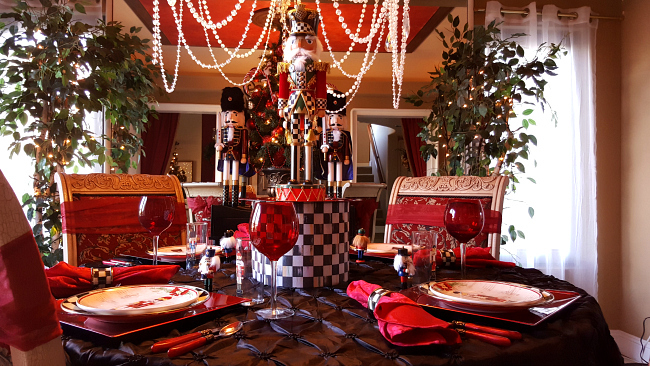 Love the dishes, glasses and all the nutcrackers. I like how you created the centerpiece arrangement and your chandelier is so festive. Sorry you are still fighting that cold. It’s miserable when you have a stressful situation going on along with being ill. Prayers for your Dad. I like the look of the Nutcrackers. So festive and fun. 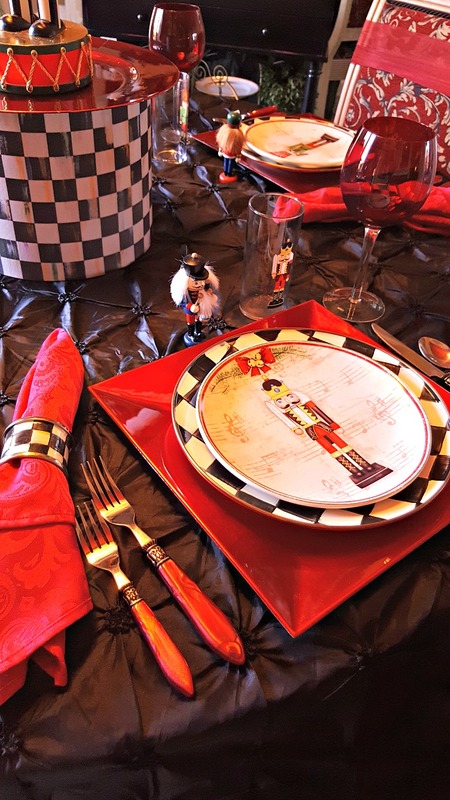 What a beautiful theme for your tablescape, Linda! I love the primary colors combined with the black and white checkerboard, it's so bright and festive :) Hope you are all better soon! Linda, your table is fun. 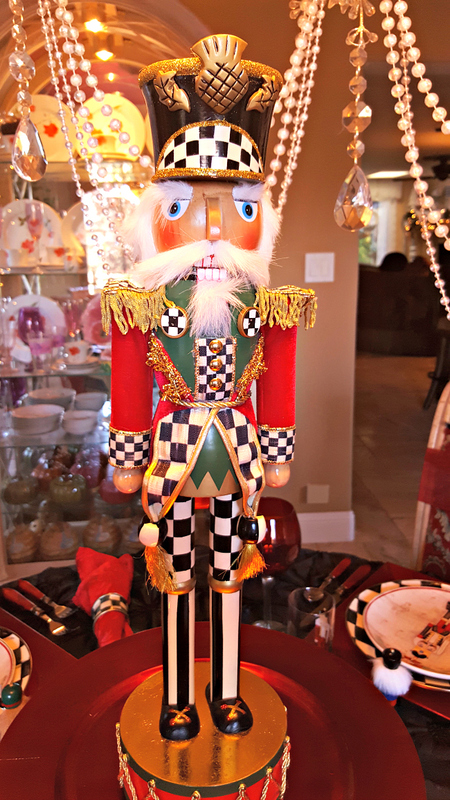 I love the MacKenzie-Childs nutcracker. I'm glad you added him to your collection. I gave my collection of nutcrackers to one of my nieces who was a dancer. It's fun to see her enjoy them now as a young adult. Sorry you are feeling bad. I hope you are better soon. 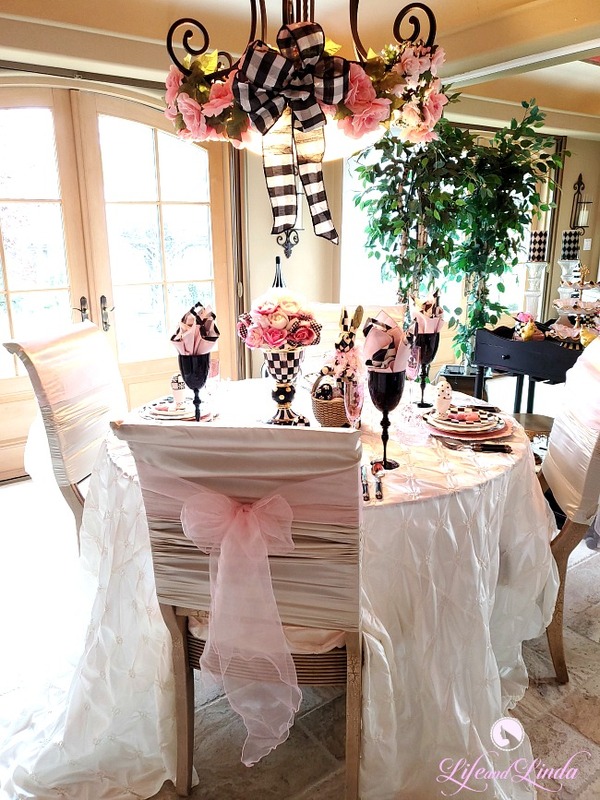 Using the lampshade for your centerpiece is such a brilliant idea!! Your nutcrackers are fabulous as well as all the nutcracker accessories, so cute!! wow!! my son is crazy about nutcrackers..
Oh, as usual, everything is absolutely beautiful, if I could just see it in person. :0)) I'm so sorry you have been sick. I have battled a cold for over a month and think it has now gone to my sinuses. My Dr. called in some new medicine today and I'm hoping it does the trick as I have a very busy week next week. 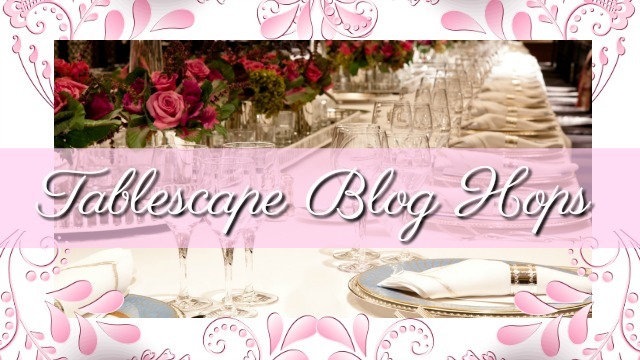 BTW, I'll be introducing Miss Scarlett in a post tomorrow. Hoping you get well quickly. Blessings! I am a nutcracker nut too! They were some of my earliest and latest collections! 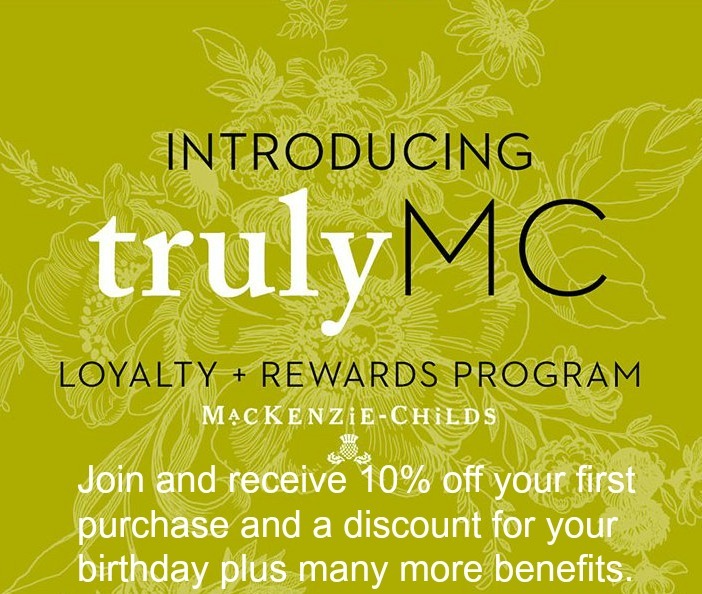 Who knew MC had one too?!! I can see that one jumping into my collection. Your plates are gorgeous and so fun. They are perfect for the table. So sorry to hear you are sick. I got sick two days after Thanksgiving and still have a little cough! Yuck I hate holiday colds. Get better soon! 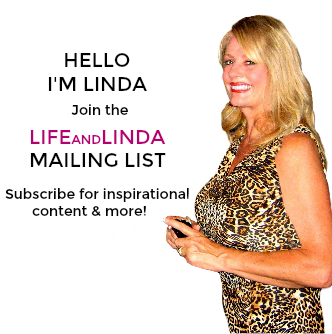 Linda, I certainly hope you are feeling better! 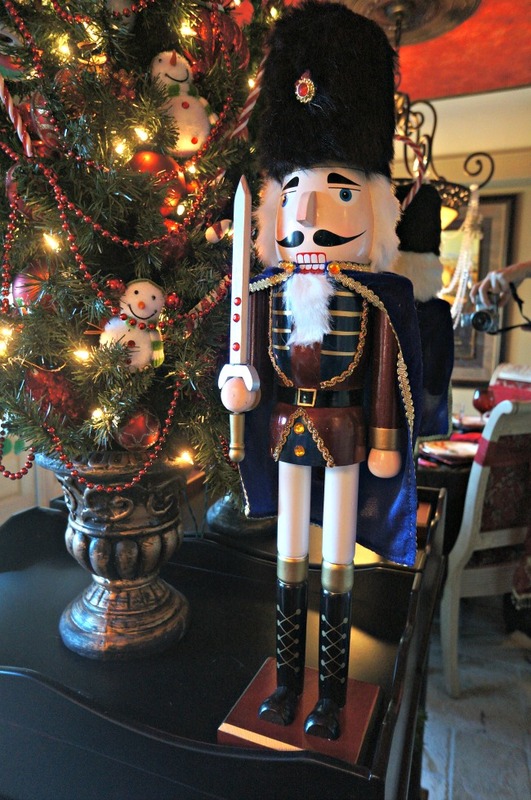 I love your new MC nutcracker and he makes a great centerpiece for your stunning table! I collect Nutcrackers...they are so fun and unique! Hope you get to feeling better Linda. 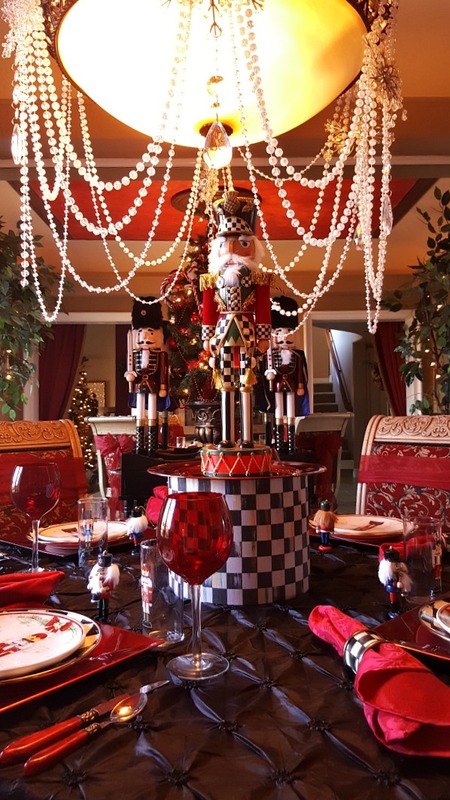 Love your nutcrackers and how clever to use a lampshade to display your newest one as part of a centerpiece for your beautiful table. The checker pattern on the nutcracker is just a match to use with the lampshade. Take care. I love this table Linda! 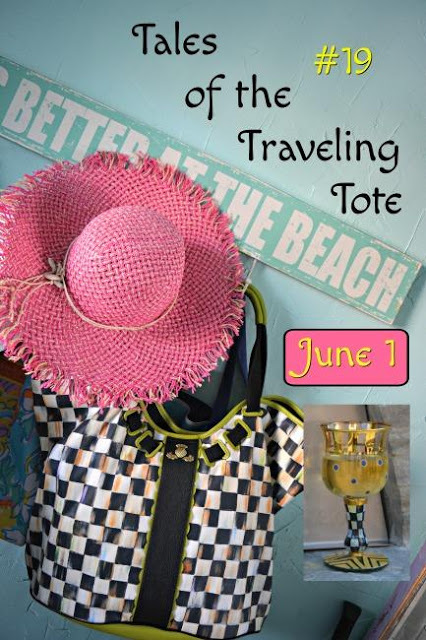 The nutcrackers and the courtly check items are perfect together. Your tables are always amazing!